Pro: You can create a course schedule that’s convenient for you. 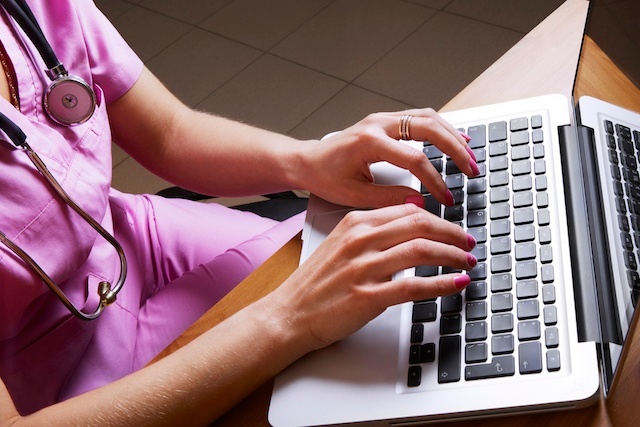 Due to unpredictable work schedules, the flexibility of setting your own class schedule can be a major benefit of online nursing degree programs. With no set class times, you can take classes from any location at the time that’s most convenient for you. Additionally, many online programs forgo fixed curriculums in the interest of allowing students to study at their own pace. In these programs, students do not have a set deadline by which they must complete coursework. Instead, they can finish the program as quickly or as slowly as they prefer. Pro: You have more choice in schools. In the past if you wanted to further your education, you may have been limited to the colleges and universities in your area that offered nursing degrees. Plus, the schools near your home may not have the best reputation or offer the kinds of courses in which you’re interested. Thanks to the nearly unlimited reach of the internet, you can enroll in classes at universities thousands of miles from your home. This is especially beneficial if you live in a rural area and don’t have the time to spend hours on the road to reach a distant university. Pro: You can save money. Online classes are often less expensive than on-site classes. Because you don’t attend classes on campus, you may not be charged additional student fees, such as athletic center fees, student activity fees and technology fees. You may also be able to access all course material online instead of purchasing textbooks that can cost up to several hundred dollars. Even if your direct costs aren’t much lower, taking an online class may still be cheaper when you consider you’ll spend less on gas, parking and room and board. Con: You can’t receive immediate feedback from your professors. In a classroom setting, you’d be able to ask for clarification from your professors or consult a fellow classmate for help. But this isn’t an option for online nursing degree programs. You can reach out to your professors via email, but it may take several days to get a response. Since you may never meet the other nurses in your program face to face, it may feel awkward asking for their assistance. Because of this, you’ll have to start assignments with deadlines sooner rather than later so that if you do have a question, you’re not scrambling to find the answer hours before a project is due. Con: It can be difficult to stay on task. When you’re exhausted from a shift or have to take care of the needs of family members, it can be tempting to postpone studying or completing assignments until you have more time. Unfortunately, one of the most likely reasons you enrolled in an online nursing degree program in the first place is your lack of free time. If you don’t stay dedicated to completing assignments on time, you may fall behind and find it difficult to catch up. If you’ve struggled with procrastination in the past, you should consider how you’ll react to the higher level of autonomy that comes with online education. Con: You have limited face-to-face interaction. In a classroom setting, you have the benefit of hearing your classmates ask questions you may not have even considered. You also can build friendships with classmates on whom you can lean in times of stress, who can empathize with you and who can make time in the classroom more enjoyable in general. If you’re enrolled in an online nursing degree program, you will likely have limited (if any) interaction with your classmates. If you’re more of an introvert, this may not be a problem. However, if you’re an extrovert, it may be a major drawback. When your free time is limited, enrolling in an online nursing degree program offers a convenient way to hone your skills and even master new healthcare technologies. Evaluating the benefits and drawbacks of any program, online or on-site, will help you ensure it truly meets your needs. Interested in additional ways to expand your skillset? Download our free guide Young, Sick and Scared: How You Can Improve Pediatric Patient Comfort and learn how to address the emotional needs of young patients.